Welsh Champion Hurdle second and Coral Cup winner Whisper took the rise to Grade One company in his stride with victory in the Silver Cross Stayers' Hurdle. Trained by Nicky Henderson and ridden by Barry Geraghty, the 4/1 chance got the better of 11/8 favourite At Fishers Cross to prove his stamina over the extended three-mile trip. Henderson said: "He has had two mega battles in his last two races and he is such a brave horse. "It was a tough race and they have gone a proper gallop. 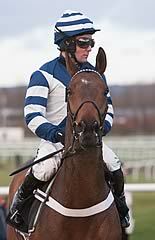 "At Fishers Cross is a top-class horse and this fellow has come a long way in a short space of time. "The Welsh Champion Hurdle was his Gold Cup this year but he ended up just getting beaten. He then won the Coral Cup by a very narrow margin and we knew handicaps would be out after that. "I felt we had to come up to three miles - two and a half would have looked a bit short for him - we thought about Thursday's race but I was pretty sure that he had to go three miles. "We wanted to try three miles now because it would almost certainly give us a clue about where we go next year, which is almost certainly chasing. We could make him into a staying hurdle but he didn't jump a few today and he can be a bit like that. He was terribly boiled up before the race. "We have lots to look forward to." Whisper elevated himself into the top flight of current long-distance hurdlers when landing the Silver Cross Stayers' Hurdle, even though he became very hot before the race and was bathed in lather. That was an ominous sign for his jockey, Barry Geraghty, who said: "He got himself into a desperate state beforehand and if you had asked me about his chance at that time I would have said 'no chance'. That was compounded by the fact that he didn't jump as well as he can. "He was so wound up today and when I wanted him to back off [at the hurdles] he wouldn't back off. He missed a good few and when we turned in I thought he was beaten, but after the third-last he started to run on again. He's as hard as nails. "He won the Coral Cup off near top weight, and that's hard to do, and he had only 3lb to find with At Fishers Cross, but while I fancied him to run well, when I saw him down at the start I thought I had no chance. "Whether he jumps fences next season is up to Nicky [Henderson] and [owner] Dai Walters, but he has the engine to do any job." Having finished third in the World Hurdle at the Cheltenham Festival, the Rebecca Curtis-trained At Fishers Cross again had to settle for a supporting role behind the Silver Cross Stayers' Hurdle winner Whisper. Curtis said of her runner-up: "He's run a blinder and was beaten by a good horse. He did lose a shoe on the first circuit but I don't think that made a great difference. "We'll see how he is doing this week and we'll think about entering him for the Punchestown Festival. We'll see nearer the time." Ten-year-old Thousand Stars posted a good staying effort to take third for the Willie Mullins team. The trainer said: "He was doing all his best work at the end. 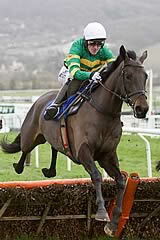 Paul [Townend] said he just got a bit of a breather into him down the back then he ran on really strongly to the line. He'll go to Punchestown now." Jockey Paul Townend added: "He's run a cracking race and was really finishing strongly. I think he's shown he still has a little of his old sparkle."